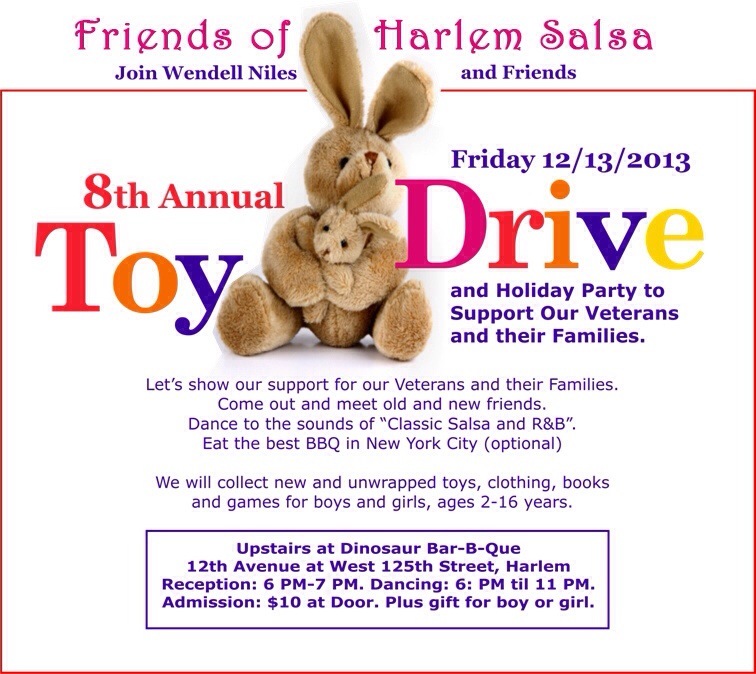 Toy drive in Harlem this evening, Harlem Salsa hosting at Dinosaur Bar-B-Que | HarlemGal Inc.
Harlem Salsa, an organization that hosts dancing every second and fourth Friday of the month after work at Dinosaur Bar-B-Que at 700 West 125th, is hosting a toy drive this evening, December 13. The toy drive is to support Veterans and their families that are struggling to make ends meet. The event starts at 6 pm. Immediately following is Harlem Salsa Friday After Work. See details below! This entry was posted in 125th Street, Community, Events, Harlem, Harlem bloggers, Harlem blogs, HarlemGal, Things to do in Harlem and tagged Harlem, Harlem Salsa, toy drive. Bookmark the permalink. ALL THIS IS GREAT NEWS!!!!! !NOW LETS CLEAN UP HARLEM WEST 128 STREET BETWEEN LENOX AND FIFTH AVE OF ONE THE WORST DRUG DEALING GANGS TERRORIZING OUR NEIGHBORHOOD!!!!!!!!!!!!!!!!! !